Warning! Turf is extremely perishable if left on the pallet in warm or wet weather. We recommend sod is installed the day it is delivered. If for some reason you can’t finish laying all the turf on the day of delivery, break the stacks down to 1/2 and water lightly for cooling. Then lay all turf the following day. Till the soil to a depth of 6 inches and allow to dry. If soil is heavy clay add organic matter prior to tilling. or gypsum in at this point. Remove debris and slope grade away from house and patio. Level and finish grades 1 inch below sidewalk and driveway. Roll with a water filled lawn roller to firm soil, if necessary. If soil is damp use less water in your roller. West of the Cascades, lime at the recommended rate (or as soil test indicates). Rake and mix lime into soil with a garden rake, or till into the soil. In other areas call your extension service or take soil tests. 10 pounds of fertilizer per 1000 square feet. Rake lightly, touching up final grade. The first row should be placed along a straight edge such as a sidewalk or driveway. Place the next row at the end of the first mashing the ends together. Avoid gaps between each row. Each adjacent row should be laid in a staggered brickwork pattern. When sodding slopes, you should lay the sod perpendicular to the slope and use stakes to hold it in place. You should use a board to stand on previous rows to spread your weight out as you work and prevent gouging the sod. Not all lawns are perfectly rectangular like sod. You will need to trim the sod along curves and irregular shapes. For a guide you can use string to cut straight lines and a garden hose for curves. It is easiest to cut the sod with a heavy knife, small hatchet, or a half-moon edger. In hot weather lightly water every 100 square feet or so, as you lay turf. 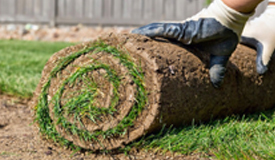 Keep turf damp while installing. DO NOT ALLOW TURF TO DRY OUT OR IT WILL PERISH. Break down pallets of sod immediately in hot, dry weather as this allows cooling. Roll with a lawn roller (1/3 to 1/2 filled with water), diagonally to the joints to firm the roots to the soil below. If soil is too wet or very soft, wait several weeks then roll, or lay plywood strips on the turf and walk on the plywood to finish the grade. Water, soaking thoroughly to a depth of 6 inches below turf. to dry out until well rooted (usually 2 to 3 weeks). After the roots of your turf are well established, frequency of watering can be reduced to once or twice a week. Watering schedule must be adapted to individual conditions. One deep watering is superior to several light waterings. Don’t water beyond the point of run off. Watering in early morning is preferred. Fertilization is the key to healthy turf. RT-2 is the proper blend of balanced nutrients (16-4-8) with slow release nitrogen and trace elements. The following is a guide for Western Oregon and Washington: (lbs per 1000 ft). Most insects are not a serious problem in Oregon and Washington. If populations do build up consult your local nursery or county extension agent for help. The best defense against weeds is healthy growing turf. When controlling weeds with herbicides be very careful around plants and flowers. Never apply on windy or rainy days.